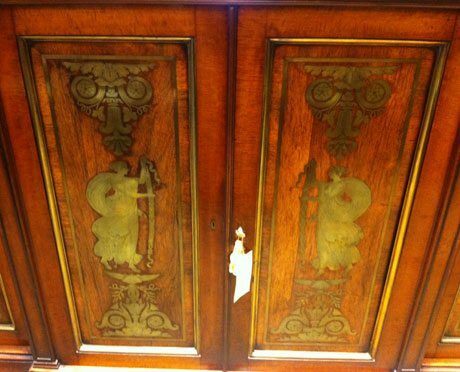 The description on a large four door cabinet at Martyn Cook Antiques elegant emporium in Sydney reads ‘A very fine William IV period mahogany and rosewood brass-inlaid four (4) door cabinet, the doors by George Bullock, of substantial rectangular breakfront form the moulded top above central doors inlaid in engraved brass depicting Greek revival maidens holding ribbon-tied scrolling foliate pedestals with conforming decoration, the side doors with fruiting rods ribbon-tied with laurel leaf wreaths below flower head rosettes, the four (4) doors divided by paneled pilasters with foliate capitals above a moulded plinth base. English, circa 1835/40 and earlier. 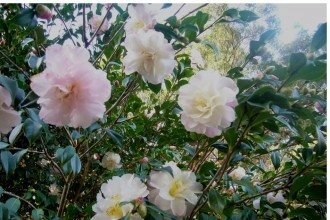 Width: 94 ½”  Depth: 18 ¾”  Height: 50 ½” ’. The four (4) door panels on the cabinet by English cabinetmaker George Bullock were originally panels from a pair of internal doors that were removed from the entrance to the ante-room during the re-modelling by German-Italian architect Alexander Roos in 1836-41 of The Deepdene, a house in Surrey. He was carrying out the work for Henry, son of the renowned designer Thomas Hope (1769 – 1830-31). 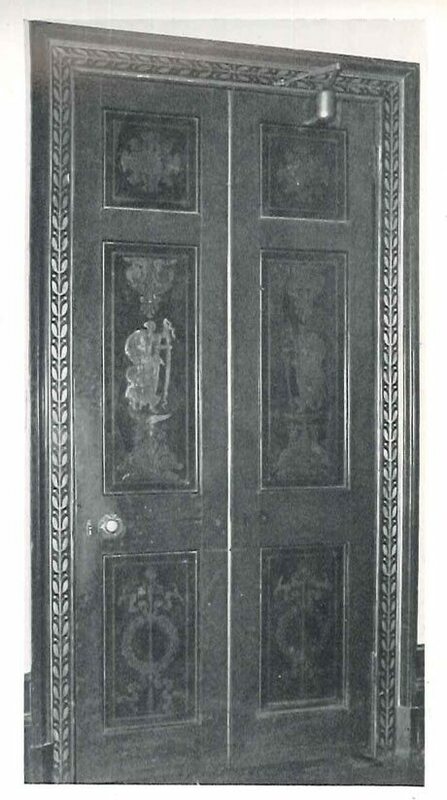 Clearly Henry Hope thought the doors designed by his father so fine, in both their subject matter and superb craftsmanship, that he decided the brass inlaid panels at least should survive his own change in fashion. Thomas Hope his father was a connoisseur, architect, furniture designer and author, the son of a banker and merchant of Amsterdam who travelled widely, studying architecture in England from 1794. 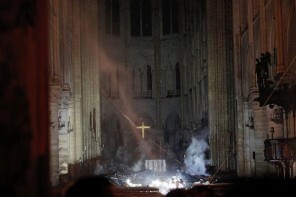 This was when the French were occupying Holland. As a self appointed patron of the arts at London, Thomas Hope’s scholarly adaptation of antique classical elements and motifs reflected his meticulous archaeological approach. His house in Duchess Street, Cavendish Square at London became famous, because he opened it by subscription to those interested in viewing his ideas about interior design and decoration. ‘The Deepdene’ had been converted by 1823 by Thomas Hope from another older building, which he had purchased in 1807 from the 11th Duke of Norfolk, who preferred his estate at Arundel. At that time Thomas Hope was considered one of the wealthiest men in England. He made many ‘improvements’ adding orangeries, galleries, a library and conservatories. He also added a garden that had an ampitheater and grotto. A blending of Italianate and Castle styles, The Deepdene expressed a particular kind of romantic vision. It managed to be both casual and sophisticated, the skyline featuring variously shaped forms that integrated well with the house and its landscape in the ‘picturesque’ taste that had continued from the late eighteenth century through to the So much so that it emerged as a much admired building in its time. 1807 was a big year for Thomas Hope. He was also married and his publication Household Furniture, would not only introduce the term Interior Decoration into the English language, but also help refurbishment to become a popular occupation among the burgeoning middle classes. Thomas Hope produced many designs for interiors and furniture and they became central to the full development, at the beginning of the nineteenth century, of what we now refer to as English Regency style. If revered twentieth century historian David Watkin had his way however, it would be known as the ‘Hope’ style. Watkin noted in his publication “Thomas Hope and the Neo-Classical Idea’ (1968) that ‘it was Thomas Hope who caused the new style to become fashionable and popular in England, or that, at any rate, to Mr Hope as much of this kind of improvement is to be attributed as it is possible, for an individual to have accomplished’. 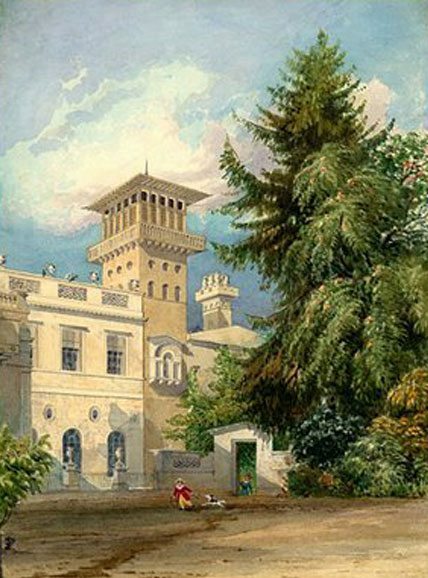 ‘we have just returned from the Deepdene… in the midst of the most romantic grounds, and surrounded by the most picturesque park I well remember, Hope (our Hope) has built, or rather is still building the most perfect Italian palace you can conceive – full of balconies, adorned on the outside with busts and crowned with terraced towers,… on the front a terraced garden, and within a hall of very large dimensions, with a tesselated pavement of mosaics and which is to hold his choicest marbles’. The ‘Hope’ he was referring to was Henry, Thomas’s son. This was when the pair of doors leading to the Ante Room at Deepdene were dismantled by Harry and the panels inset into this stylish cabinet. 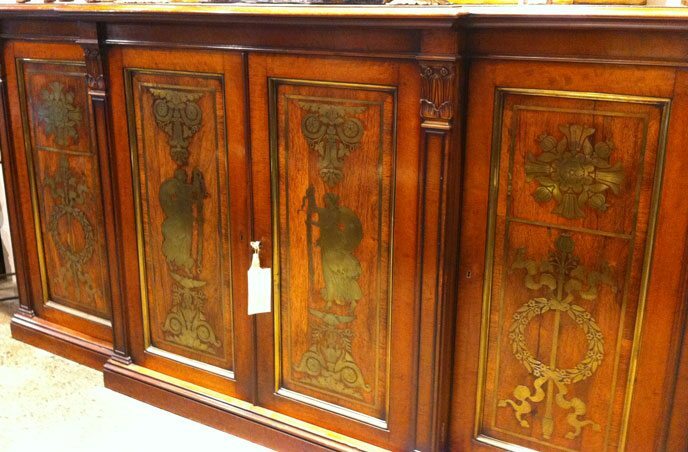 Setting brass into timber at all is a particular skill, and a mark of fine craftsmanship. The technique was originally developed by sixteenth century Italian craftsmen but it was perfected by renowned seventeenth French cabinetmaker André Charles Boulle (1642-1732), whose work spanned 30 years of both the seventeenth and eighteenth centuries, including creating much of the furniture for Louis XIV at the Chateau of Versailles. 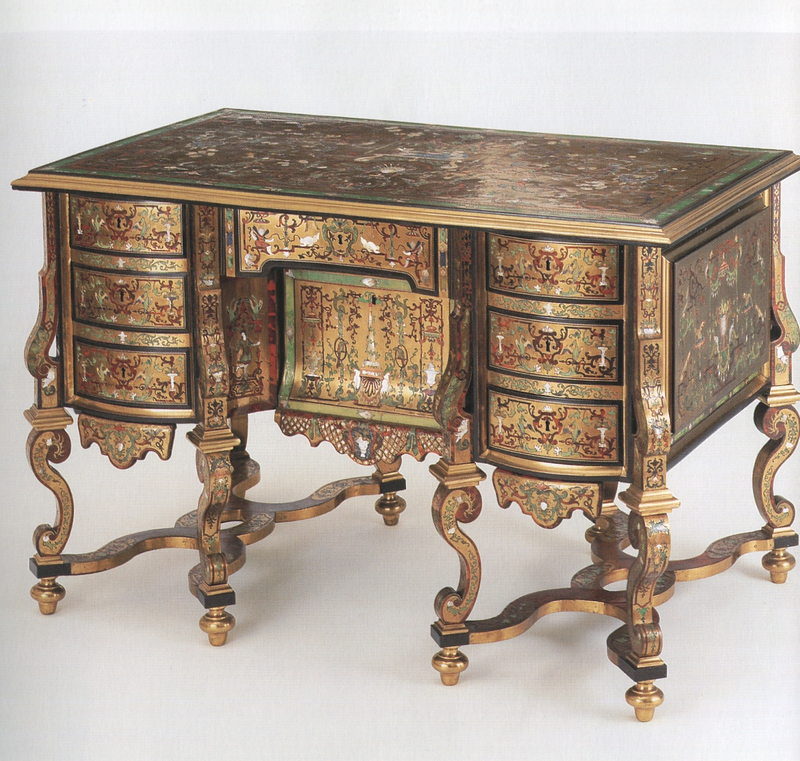 He inlaid metals, shells and pearls on ebony in furniture, in a technique that was named ‘Boulle’ for him. The standards he achieved were superbly high. The technique was copied later by such renowned London based craftsmen as Gerrit Jensen (1680 – 1715), whose works can be found in the collection of the Queen of England and, George Bullock (1777- 1818). George Bullock only had a short career in the trade of his choice but he left his mark indelibly on the landscape of decorative arts. 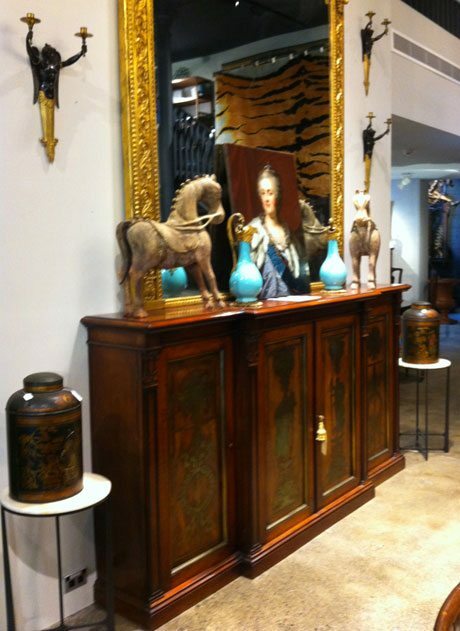 His style over a number of his pieces, reflects the influence of the French style and while much of his furniture followed the classical idiom, he also developed pieces in the Gothic, Elizabethan and Jacobean taste. It was George Bullock who produced not only the doors for The Deepdene, but also provided the English government with furnishings for Napoleon Bonaparte at Longwood, the house the English exiled him to on St. Helena Island. The Deepdene itself after having its estate carved up in the 1920’s for housing was a hotel for a while and then used by the Southern Railway during World War II. It was demolished in 1967 to make way for urban development. Today this piece of furniture, apart from being very useful, is beautiful to look at and of historical, cultural and social significance. I just came onto your post and found it quite interesting. I am also associated with Cast Iron Radiators, Oak Doors and love to enjoy the stuff on the same as its rarely found on internet. Thanks again for writing such a good post.